John is pleasant and appears knowledgeable.I used them for paving repairs, landscaping and sealing. When they worked they did a decent job, however when I had to get them back for finishing touches and warranty work, it became very frustrating. Overall I would not recommend Sealer People, as they don't keep appointment times and don't neatly finish off jobs. Whats a 2 yer warranty worth, if you struggle to get service? I hired this company to do a backyard patio installation. The work was completed a couple weeks past agreed end date in contract. Other aspects of the agreed project were not completed without prompting. Lastly due to an issue with digging for drainage pipe, the contractor was to provide a partial refund and as of the time of thi review, hasn't been received. Overall the job was completed and patio looks nice but I can't recommend this company due to issues mentioned above. On an aside, I would recommend that with all projects that you make sure that your contract is as detailed as possible. I emailed John through homestars on Wednesday, got a reply Thursday and also called him as well. Spoke to him on the phone regarding my situation and he was on site by Friday afternoon. I called Friday morning to confirm our appointment, and despite him being down a person and a bit behind schedule he still was able to make it within the time frame he told me. So A+ for communication and punctuality so far! Very friendly, down to earth and willing to listen to what I had wanted to do. I had wanted to get my asphalt driveway sealed as I live in a townhouse with a shared driveway. The person I had bought it from had done a very bad job of sealing before and the line dividing my side of the driveway with my neighbors was all curved giving me less of a driveway then my neighbors. My neighbors for god knows what reasons seem to always have about 4+ cars on their 2 car townhouse driveway (they also have interlock) that seem to have license plates from Florida, Virginia, New Hampshire and a bunch of other places. And of course they always parked right on the line if not over, which so happened to curve right into my share of the driveway making it a pain to pull out and in from. Its incredibly annoying coming home and seeing a crammed driveway with someones bumper sticking onto my side too. John and his crew did a clean up of all the dirt on the driveway to make sure there was no debris while sealing. He also used wood boards to make sure that he did not over spray onto my lawn, my house or anywhere else except onto my asphalt driveway. Most importantly for me, he helped me to measure out the driveway to make sure of where our line should exactly be divided. I didn't want any disputes with my neighbor, and John was spot on while setting up. He used tape to line it all up, made sure that I took a look and was satisfied with how straight it was then it was onto the spraying. My driveway now has a clear contrast with my neighbor, and looks as good as new as well as straight as an arrow right down the middle as I needed it to be. 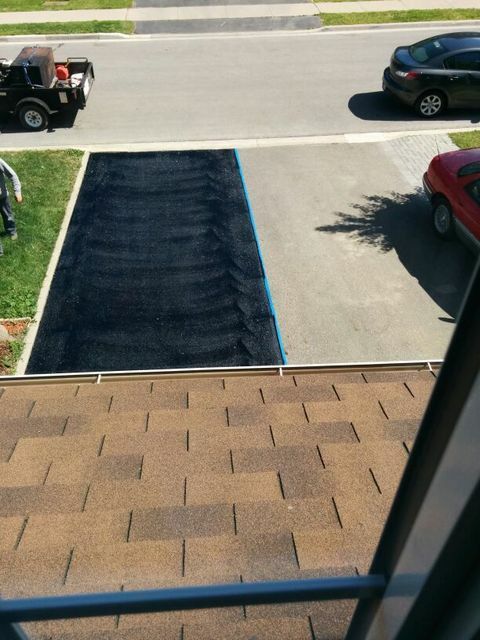 Yes I know it may look a bit funny having a driveway look "half sealed" but thats the price I am willing to pay if it clearly ensures my property line is clear. John took the time to understand my annoyance at my neighbors infringing on my space, and also had some other suggestions to further help make clear the lines if I wanted to go further. It goes a long way when someone doesn't come barreling in does a rush job and sticks their hand out to get paid. John was the total opposite of this, and even though this was a relatively small job it meant something to me and he took the time to care for it like he cared just as much as I did about my property. I also had a conversation with John regarding potentially putting in interlock and the process and would definitely call him in the future when I am ready. If everyone was charging the same price, the most important difference then would be whether the job is done right. I have no question that what John says he will do, he will do it right or make it right. You get what you pay for, and John is worth it. I would not hesitate to recommend or use John again, and in fact I have already spoken to a friend about him. John and his team is great contractors! I love working with them. I gave John a budget and he knew not to go over the budget. They create a fantastic oasis of a backyard. Most Contractors would go over the budget or the design would not be what you wanted. I had a bad experience with other contractors. John Proved there were good contractors, John and his team came when there were suppose to. When I call him he always called me back I didn't have to wait 1-2 days to hear back from him. It was incredible that they created a fabulous backyard in 2 days. Next year they are coming back to do my walkway and driveway. I would recommend John and his team to anyone. I had John & Josh from Sealer People repair my driveway Interlocking stones & patio. My wife & I had originally thought we had to install all new stones which would cost thousands. John convinced us that he could take what looked as bad as it did & "Make it look new again"
They did as he said, my driveway & patio look fantastic. These guys are hard working, honest people. They repaired all the sunken areas, replaced many broken pieces & lastly powerwashed & sealed the entire surface. After hearing so many bad things with contractors tryig to rip people off & take as much money as they can, I'm glad to have encountered Sealer People. They literally saved us thousands of dollars. I will recommend Sealer People & I will be using them again. Perma Landscape Paving & Construction has not added any photos. From New Installations to repairing your existing surfaces, our company has the knowledge, experience & staff to get the job done right. In operation for almost 2 decades, owner operated & fully Insured.